No traffic is permitted along the entire length of the road up to the castle, either from Tirolo or from Castel Torre. Walking up from either side requires a good 20 minutes. Taxis are permitted and a shuttle service is offered for events. All three establishments (the museum, the “Gasthaus Schloss Tirol” and the aviary and bird care centre) are closed on Mondays. Your four-legged friend is only allowed entry in a pet carrier, available for hire at the till. Castle Tyrol closes on 10 December each year and re-opens to the public around the middle of March. We regret to inform you that most of the castle is without step-free access. Audio guides in German, Italian and English are available at the till. The audio guides provide a self-guided tour of the building and its art. As you go round the museum you will gain an insight into how the castle was built and details of the artistic treasures on display, as well as hear details of the history of the region. Guided tours for school classes and groups are only available if booked in advance. NB: we would kindly request you to arrive on time for your guided tour, and to bear in mind that the walk from Tirolo to the castle takes about 25-30 minutes (from the coach park around 40 minutes). Please be advised that in the event of delays the guided tour may need to be shortened, and in the event of non-appearance a charge of € 32.00 per museum facilitator will be added to the bill. Written cancellation is possible up to the day before. If the guided tour is booked for a Saturday or Sunday, we need to be informed of the cancellation by 4 pm on the preceding Friday at the latest. Nowadays the Knight’s Hall and the Burgrave’s Hall are used for conferences and meetings. The room can be hired on application. The Visitors Books of Castle Tyrol which go back to 1832 have all been digitised and evaluated. You can look up any visitors you are interested in – perhaps you will find somebody from your family! Enter any name you like and start your search! Good luck! By car to Tirolo. The road to the castle is closed to cars. There is a car park opposite the Minigolf and another opposite the Raiffeisen Bank, parking charges apply. You can reach the castle in about 30 minutes’ walk. Via Castel Torre. From Merano, take Via Laurin to Castel Torre, and then to St. Peter. From Castel Torre onwards the road is closed to cars. There is no car park! It takes about 20-30 minutes to walk to the castle. By bus. 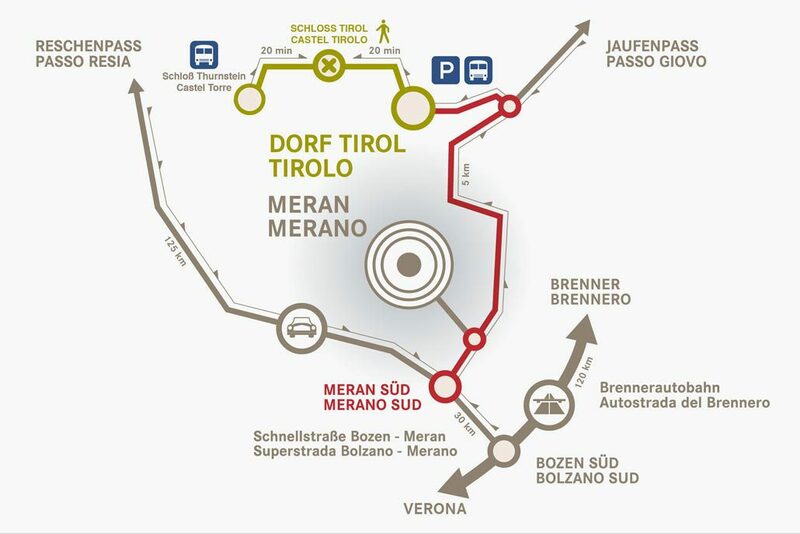 There is a regular bus service to Tirolo as well as to Castel Torre.